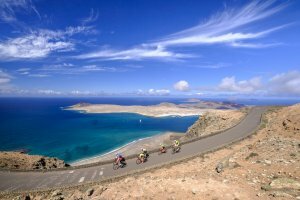 Cycle Lanzarote and immerse this beautiful Canary Island. Cycle along the beautiful coastlines with views of secluded coves and sunny beaches, Beautiful landscapes with black volcanic peaks and old colonial architecture. 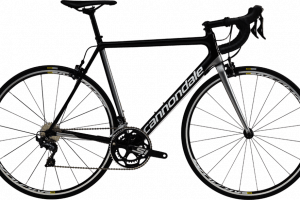 Furthermore you will cycle all the top class places on Lanzarote. 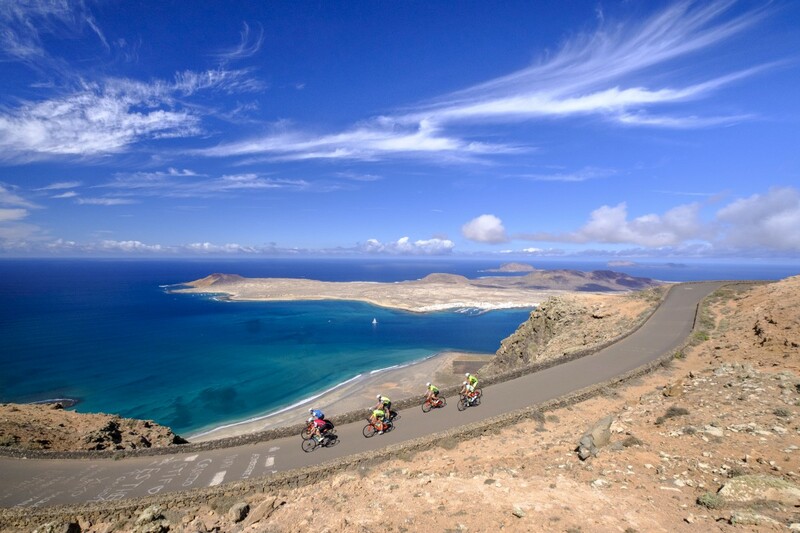 Cycle Lanzarote and immerse this beautiful Canary Island! Together with the fellow partners on Lanzarote you will cycle to the most spectacular places on . The roads are perfect and unlike Tenerife and the Canary Islands, the mountains are not so steep and high. Not only the weather is a big advantage of Lanzarote, but also the beauty of the island. 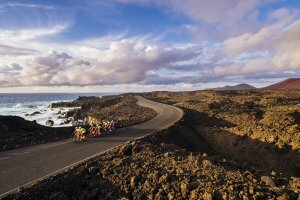 For example, cycle through the Timanfaya National Park and discover the unique volcanic lunar landscapes on the south-eastern side of Lanzarote. 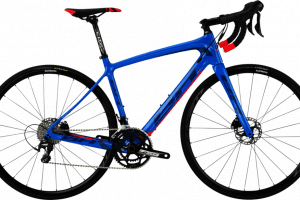 The rides are especially relevant because it’s designed for the cyclist who likes to pedal challenging routes. Cycle along the beautiful coastlines with views of secluded coves and sunny beaches, Beautiful landscapes with black volcanic peaks and old colonial architecture. 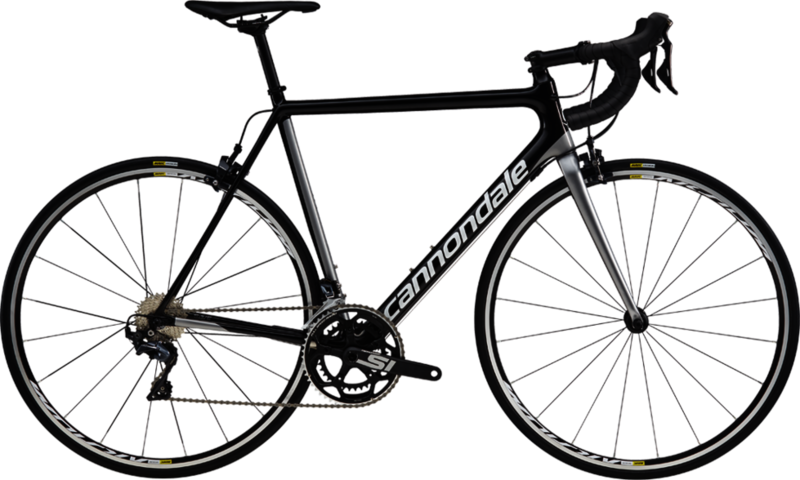 Furthermore you will cycle all the top class places on Lanzarote. 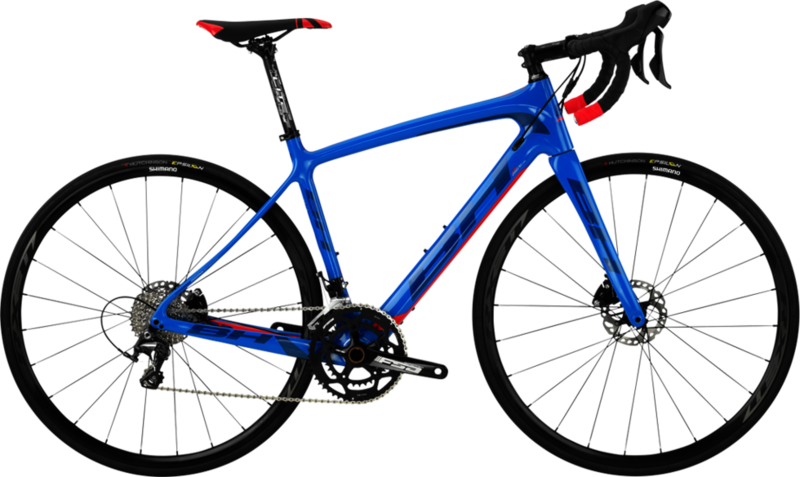 All the road bikes are premium – high-end models from the best brands available, including BH, Cannondale and Specialized, They’re all current models with premium components. You will head towards the western part of Lanzarote and follow the “donkey road” that leads to Tías. From here it´s a relatively flat section until you reach Famara. The wind might be “against us” and this will slow down our tempo, however, the stunning views of the Famara cliffs will be rewarding. There´s a break planned at the fishing village of La Santa. 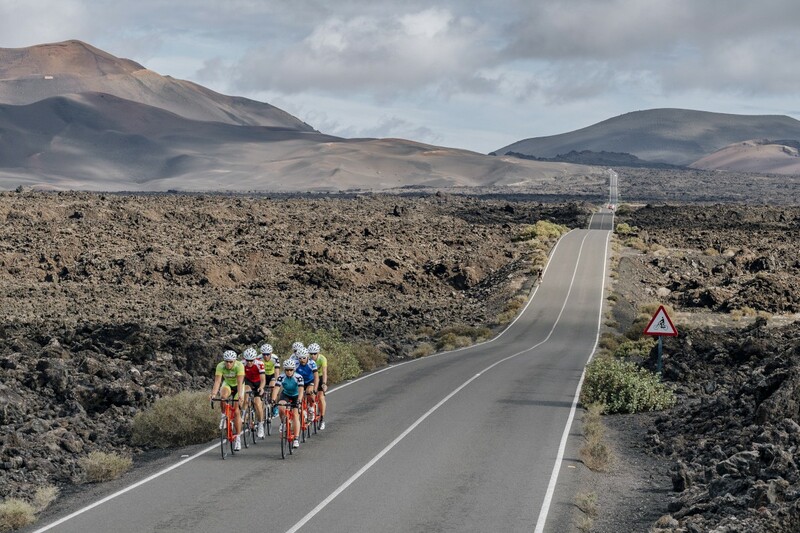 Later in the day, there is a 7 kilometer climb to Tinajo, before crossing some volcanic landscape with the wind pushing you back until you arrive at Puerto del Carmen. 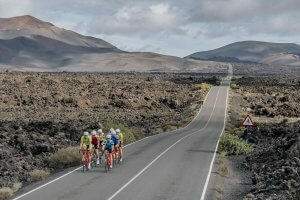 The 10 km climb in the Tabayesco Valley is a must for every cyclist visiting Lanzarote. Starting point is from Puerto del Carmen towards Tías, Masdache and then Teguise, the old capital of Lanzarote. 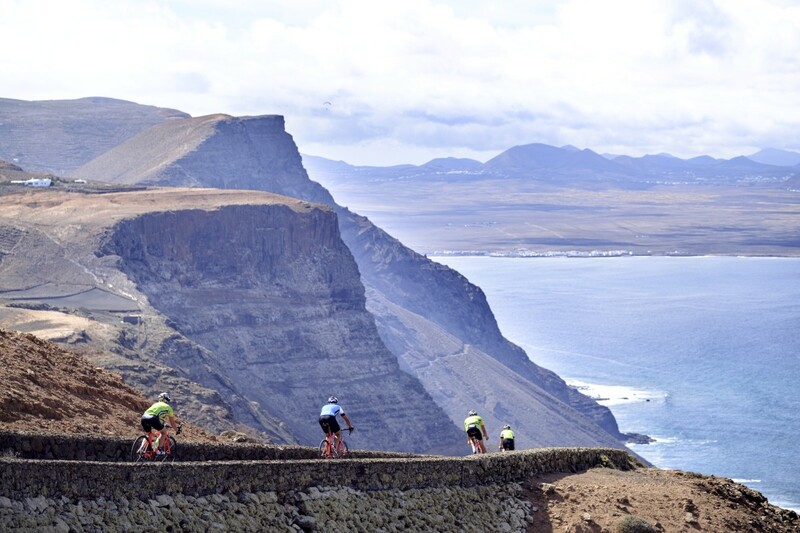 From Teguise you can enjoy a fast downhill towards the Tabayesco Valley cruising through coastal villages, aloe vera fields and cactus gardens. On the summit you can have a lunch-break at Los Helechos Restaurant. The last 40 km are on easy terrain, descending from 600m to sea level. First destination is the village of Puerto Calero and the 10 km climb of La Asomada which will test your legs straight away. The route continues to the southern town of Playa Blanca, passing through Conil, down to the Wine Valley of Uga and the beautiful village of Yaiza. The toughest part of the day is the challenging 4 km climb to Femes (max. 20% gradient). Don’t miss the awesome views of Playa Blanca and the island of Fuerteventura during your lunch-break. On the way back to Puerto del Carmen you will pass by many Bodegas. You will start climbing up to Tías and Montaña Blanca reaching Monumento al Campesino by César Manrique and continuing upwards to Teguise and the small village of Los Valles. A relaxing descent towards the historic village of Haría, in the Valley of a Thousand Palm Trees, awaits us. From here to El Mirador del Río, it will be up and down till you reach the breathtaking viewpoint of La Graciosa Island and surroundings. The way back is rather easy, mostly downhill. The group split half way down the El Mirador del Río descent. Sport goes to Orzola and Hobby to Arrieta. 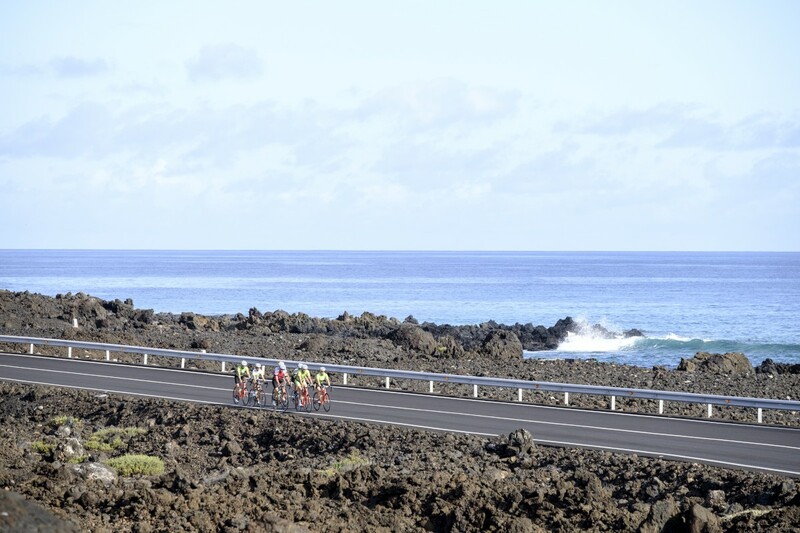 You start the day riding towards Puerto Calero, from there the route continues in a single-file towards Uga. You will enter the Montañas del Fuego (The Fire Mountains) with a challenging climb (5 km long) in a windy area till you reach the summit where you will see the camels for Safaris. From Tinajo it goes -first downhill- to the fishing village of La Santa and then uphill to Soo and Tiagua. You head back to Puerto del Carmen passing through Tinguaton and Coni. This is a relatively flat ride except for the first kilometers after the start in Puerto del Carmen. You will head towards the center of the island cruising through some impressive volcanic landscapes including Las Montañas del Fuego (The Fire Mountains). 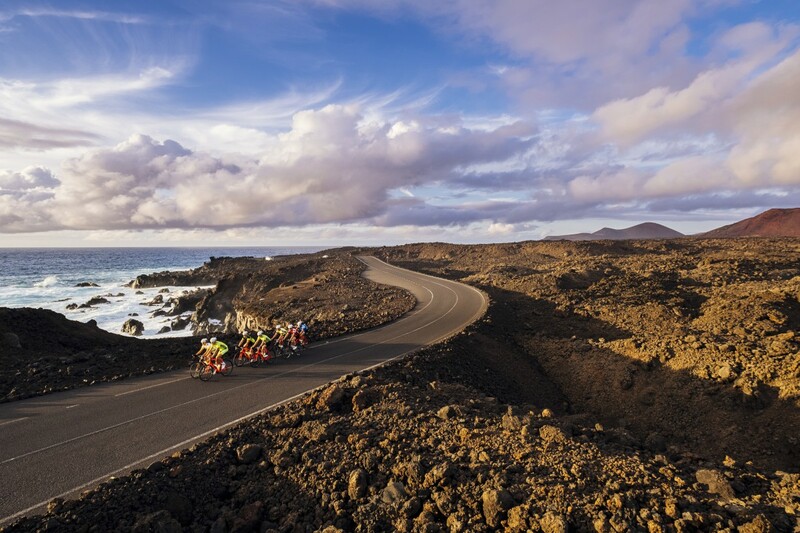 The next section is one of every cyclist´s favorite roads along the coast near El Golfo. After riding through Yaiza and Puerto Calera, the last kilometers are mostly downhill with a welcoming tailwind. Lanzarote main airport is Aeropuerto in San Bartolomé and the most important hub to all destinations in Lanzarote. There are many regular flights to/ from Europe. The airport is 5 km southwest from Arrecife. The popular resorts of Puerto del Carmen and Playa Blanca can be reached by bus line 161, the bus leaves every 30 to 60 minutes from Terminal 1 and Terminal 2 on weekdays. Bus line 161 runs less frequently at weekends and on public holidays, up to one time per hour. A one-way trip to Puerto del Carmen costs € 1.40, the price of a bus ticket to Playa Blanca is € 3.30. The drive to Puerto del Carmen takes 20 minutes, to Playa Blanca you are 50 minutes away.